I have walked past the giant boat named Empress Lilly at Downtown Disney hundreds of times. 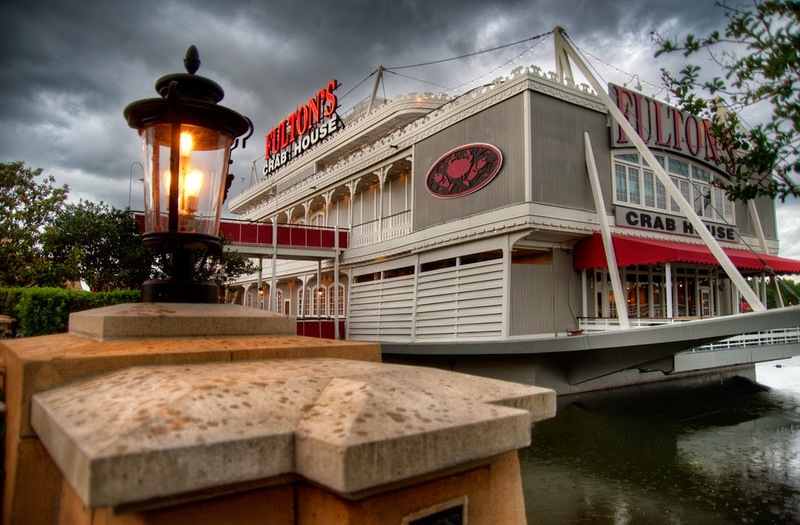 This boat, named after Walt Disney's widow Lillian is now home to Fulton's Crab House and I finally got a chance to walk in those doors while in town for Walt Disney World Marathon Weekend. My best friend and I were looking for something different to do for lunch and being she isn't a pass holder (shame on her), our lunch options were limited. The first thing we did was pick out a bottle of wine. Cambria Chardonnay it was! I don't recall the price of the bottle but it was around the $30 range. When it came time to order, my decision had been made from the time I made our reservations - Lobster grilled cheese. Let me tell you, this was worth every single calorie. Tillamook Cheddar, smoked Gouda, Provolone, confit tomatoes, and cold water lobster served between two pieces of grilled Texas Toast. Good lord. It was very rich and I could only eat half but it was a great sandwich. As mentioned above, Keri was going to get their chopped salad but changed her mind when she saw the blackened fish taco's on the menu.She was very satisfied with her decision. The daily catch is served with pico de gallo, queso fresco and guacamole. They were fresh and delicious. Our bill came out to around $80 which is a little pricey for lunch, but we did have a bottle of wine and my sandwich set us back $20 so we didn't go into sticker shock. While sitting in Fulton's, I could only think at the changes that are about to happen with Disney Springs over the next year!